Yesterday was your first experience at a Field Day. It was a little bit crazy, but lots of fun. The two kindergarten classes were together while the first and second graders were on the other side of the field. JSL and I watched you with the rest of the kids. 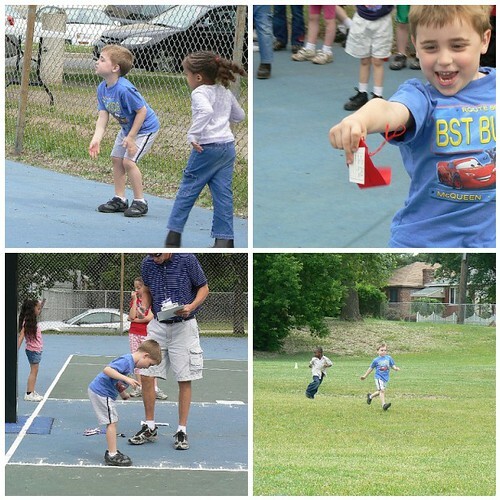 We were so proud of you when you won the second place ribbon for the bean bag toss. You were amazing when you did the standing long jump. Who knew you were able to leap like a big frog?! Then you were in the second group of racers for the run across the big field. We watched as you easily flew across the field for the first place ribbon. Then last night you were so tired at the late dinner for Nana’s birthday. You sat next to Mimi showing her how you write, thanks to Aunt M’s crayons and Aunt S having paper. You did not understand a fancy restaurant and waiting so long for food. When the meal was over and we finally got into the car after the long day you were tired. When we asked you said you were falling asleep. 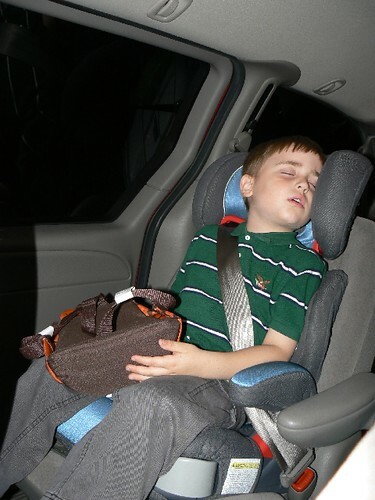 Sure enough before we arrived home you were sleeping in your booster seat.